Bronchiectasis is defined as irreversible dilatation of a portion of the bronchial tree. 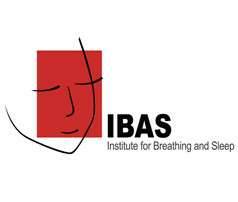 The three most important mechanisms that contribute to the pathogenesis of bronchiectasis are infection, airway obstruction and peribronchial fibrosis. 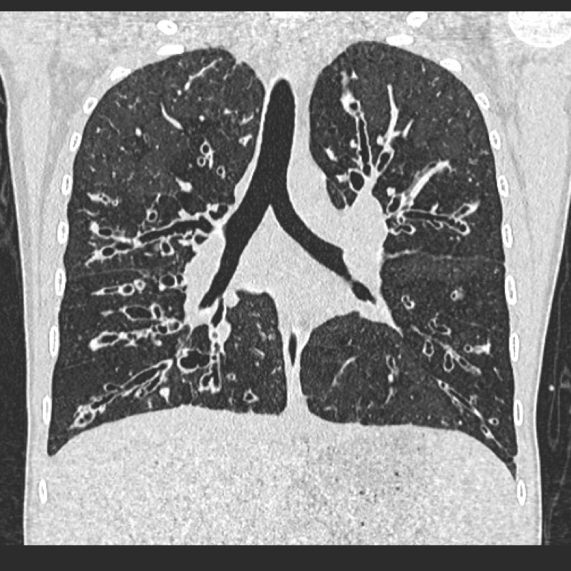 Imaging plays a pivotal role in the diagnosis of bronchiectasis. 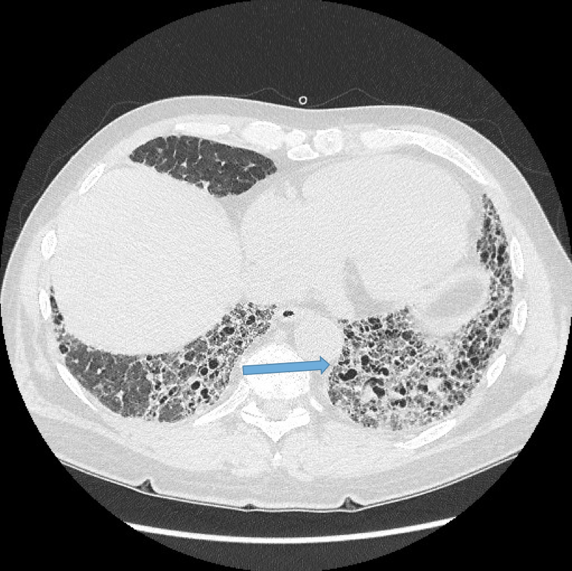 High-resolution computed tomography (HRCT) is the cornerstone in the radiological diagnosis of clinically suspicious cases. HRCT is the most sensitive and specific non-invasive method for diagnosing bronchiectasis. In addition to making the diagnosis, the pattern of disease on HRCT may enable one to limit the differential to a single/few specific causative entities. 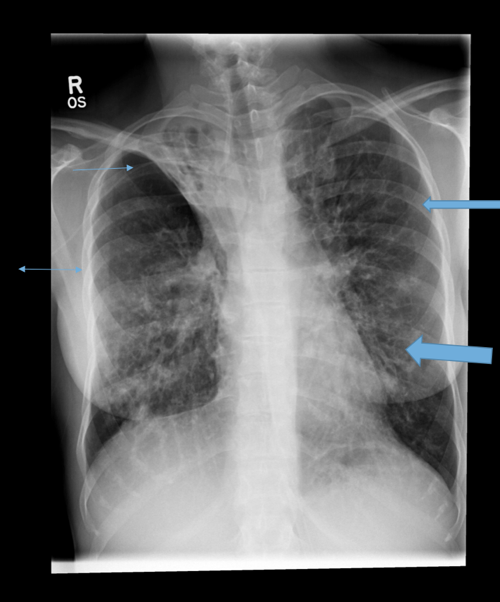 The CXR in affected individuals is often normal or shows non specific findings. Its role has largely been reduced to surveillance for intercurrent infection, progressive lobar collapse or suspected development of cavitary disease in patients with known bronchiectasis. Certain descriptive terms have been used in reporting of bronchiectasis. These only describe the appearance of the involved airways but do not elude to a specific cause. This description applies to dilated airways seen in a horizontal orientation. Implies non uniform bronchial dilatation. Fig 2. Young adult with cystic fibrosis. 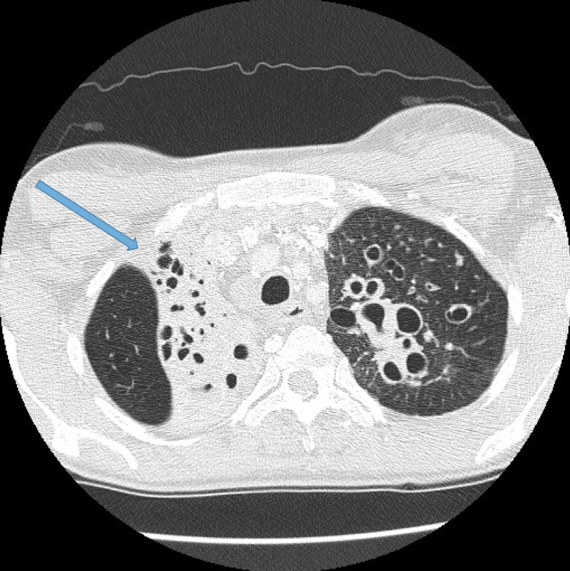 Arrows demonstrate mucous plugging of dilated airways. Multidetector CT scanners enable volumetric data acquisition with scans obtained through the entire thorax in a single breath-hold. This can be obtained in a few seconds or less thereby minimising respiratory and cardiac motion artefact. Images can then be reconstructed in multiple planes and slice thicknesses. 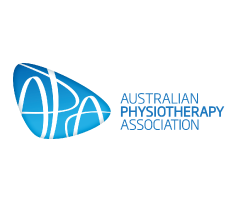 It is recommended that thin slice images be reconstructed between 1-2 mm thick every 10mm, i.e. non contiguous scans. With this technique there are gaps in the viewed images therefore a second series should also be provided from the volumetric dataset containing thicker (5mm) but contiguous slices. 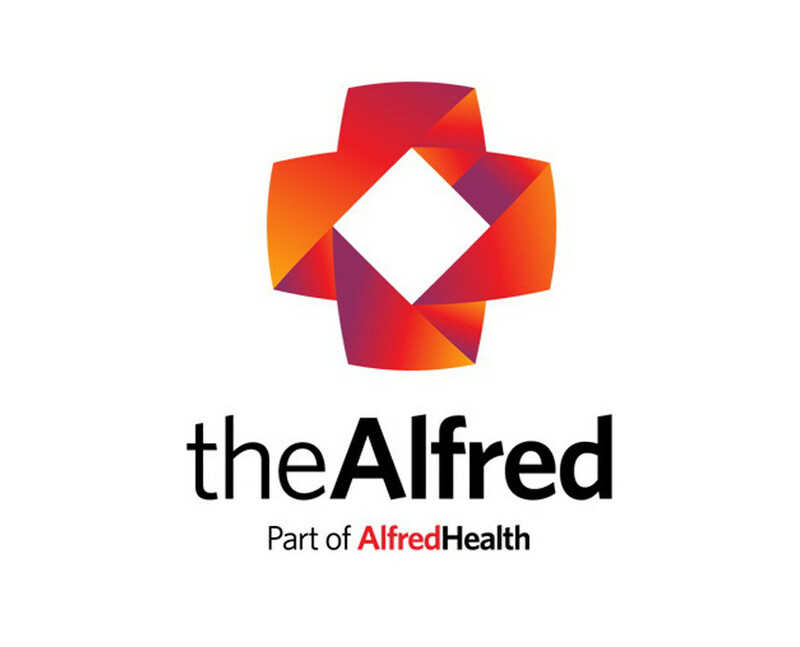 This ensures that additional pathologies such as small lung nodules or neoplasms are not inadvertently missed. Occasionally it may be helpful to also acquire expiratory images to assess the degree of air trapping, both focal and diffuse. 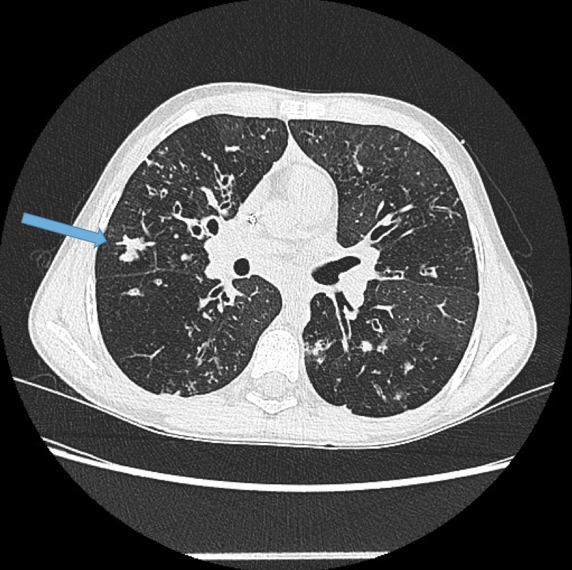 Although this does create issues around increased radiation dose, in certain clinical situations it can be justified, for example the clinician may be suspicious for small airways involvement which is not readily appreciated on the inspiratory HRCT. Expiration can exaggerate these findings by demonstrating mosaic/geographic regions of air trapping. 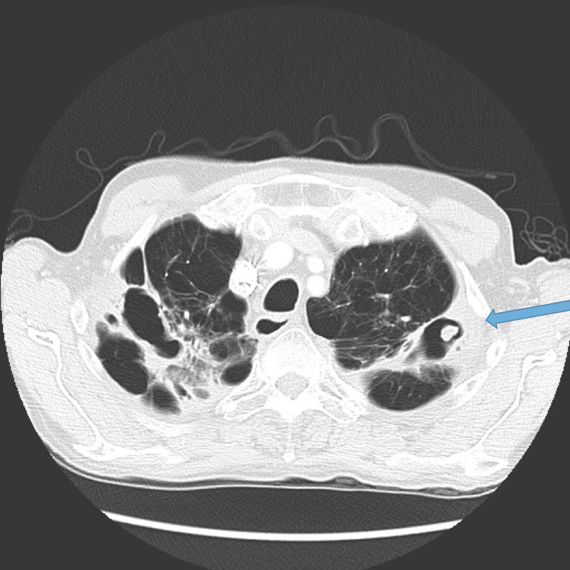 A specific condition where this may be seen is obliterative bronchiolitis. 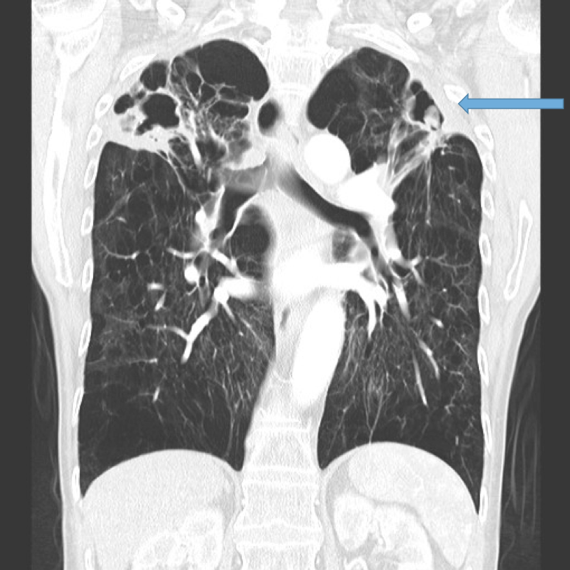 Fig 3c Young adult with cystic fibrosis. 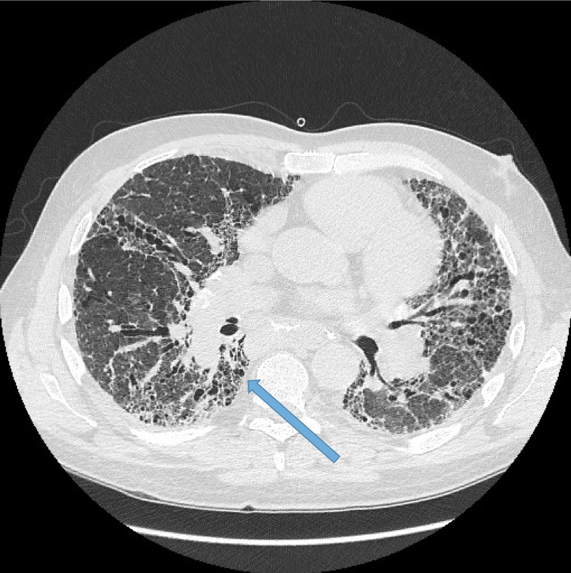 Arrow: Cylindrical (tubular) bronchiectasis. 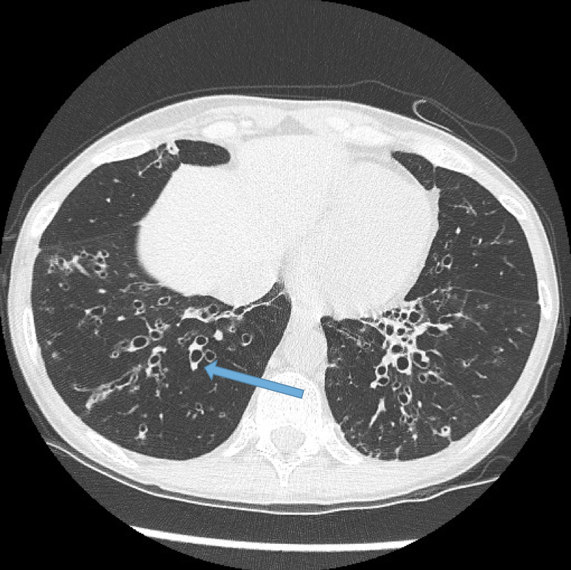 Visualisation of bronchi within 1 cm of the costal pleura. Mosaic lung attenuation. This term is used to describe heterogeneous lung density due to air trapping in the affected lung segments and as a result has a geographic distribution. This finding can be produced or exaggerated on expiration. Fig 9. Fig 7. Young adult with cystic fibrosis. Mucoid impaction of bronchiectatic airways. This often demonstrates a branching configuration. Fig 8. Young adult with cystic fibrosis. Marked bronchial wall thickening. Fig 9. Adult with cystic fibrosis. 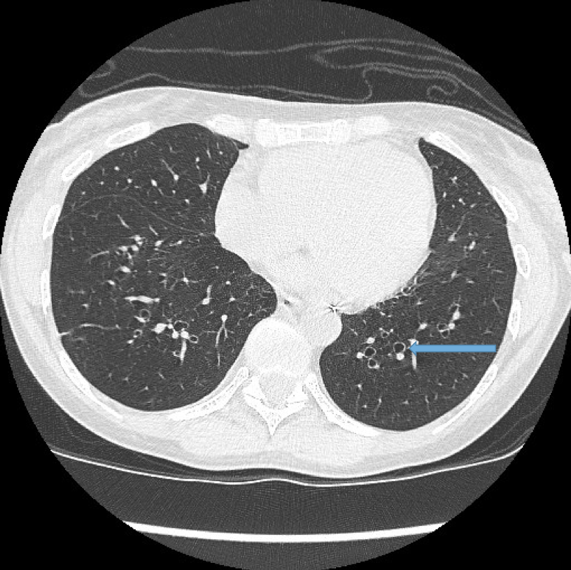 Mosaic attenuation of the lung due to air trapping in segments of lung affected by bronchiectasis. The air trapping gives rise to hyperlucent (darker) pulmonary segments. Fig 11. 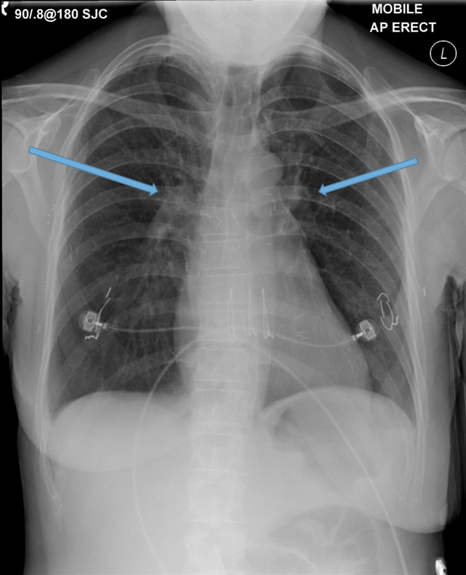 Adult female post bilateral lung transplants complicated by obliterative bronchiolitis. 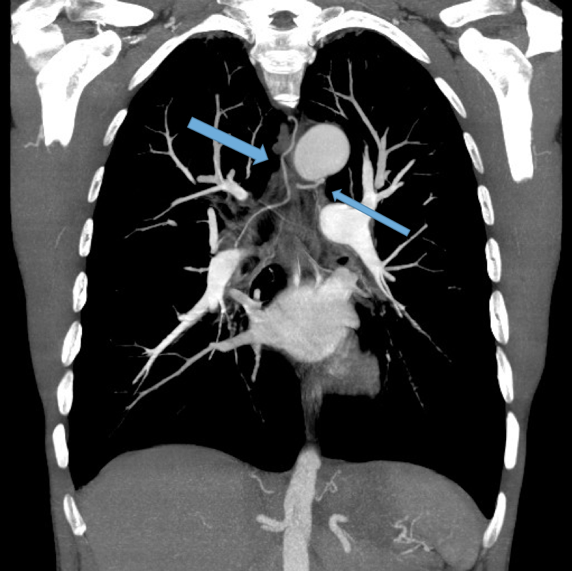 Note enlarged central pulmonary arteries (arrows). Fig 12. 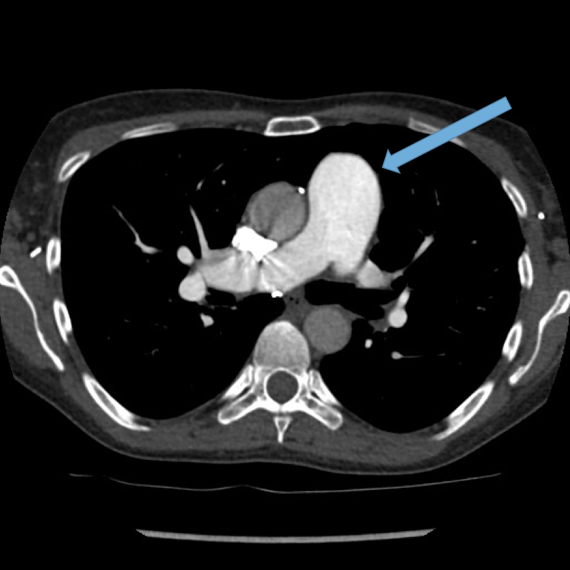 Axial contrast enhanced CT demonstrating enlarged pulmonary trunk in a patient with pulmonary hypertension (arrow). Aspergillus fumigatus is a fungus that may colonise dilated airways or bullae/cavities. It is an important cause of haemoptysis. Fig 13b. Young adult female with cystic fibrosis. 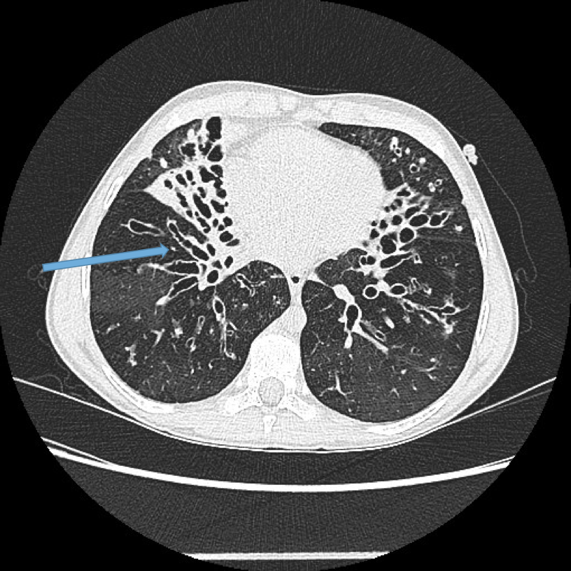 Long standing middle and lingular collapse (arrows) Background severe bronchiectasis. Fig 14a. Elderly male with COPD and upper lobe bronchiectasis and scarring. New haemoptysis. 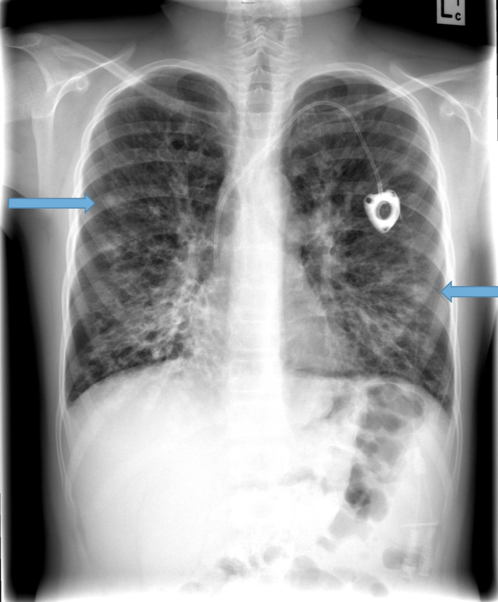 Questionable soft tissue nodule within a left upper lobe bullous (arrow). Fig 14b. 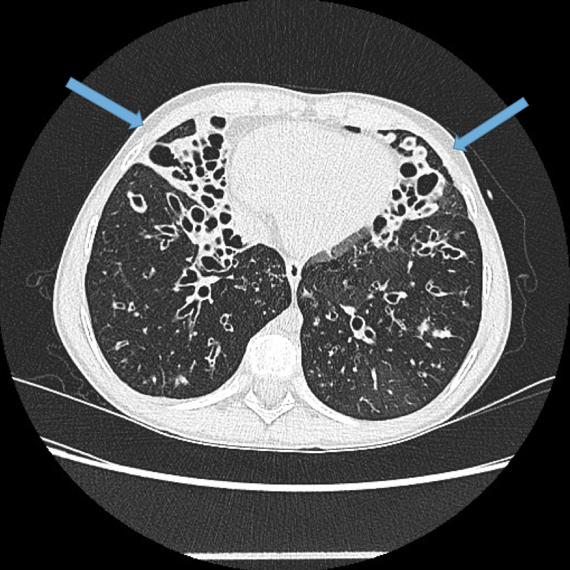 Axial CT scan on lung windows. 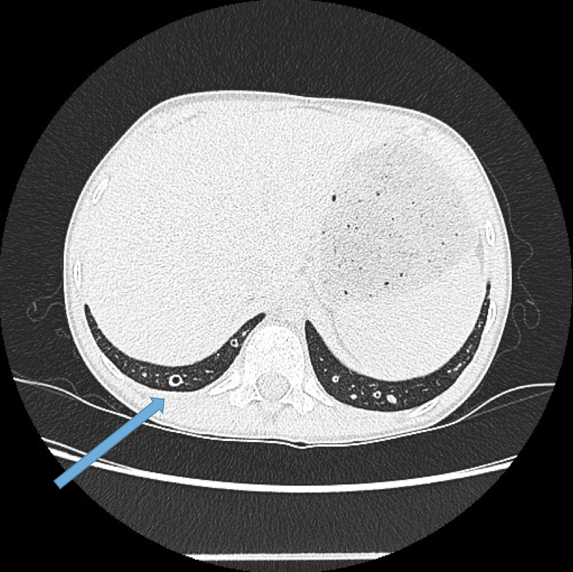 Mycetoma within the left upper lobe bullous (arrow). Fig 14c. 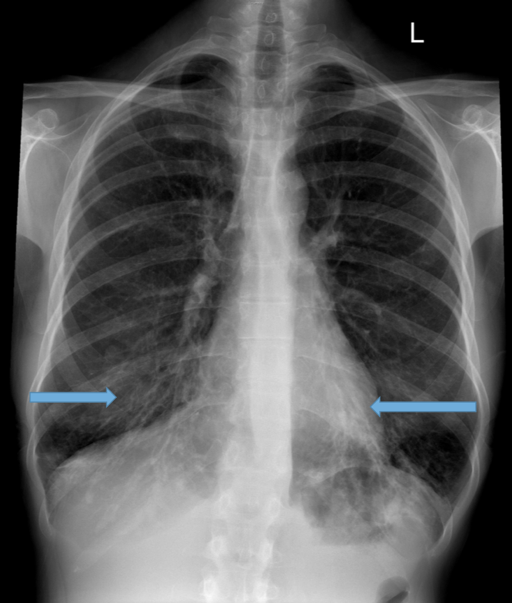 Coronal reformat demonstrating bilateral upper lobe bullae, scarring and bronchiectasis with a fungus ball on the left (arrow). 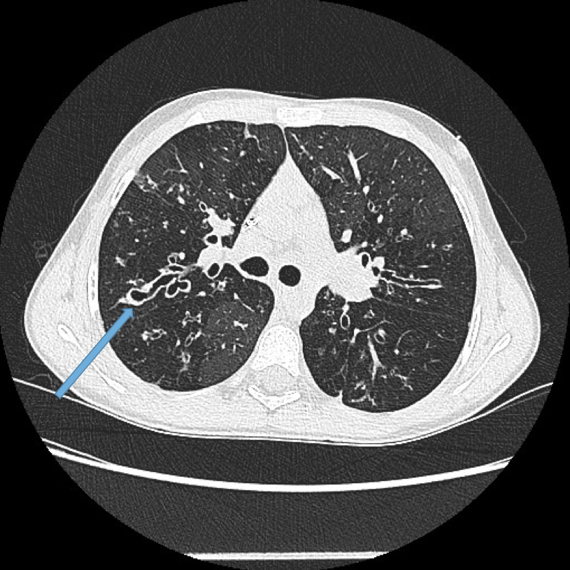 HRCT continues to be the gold standard for establishing the diagnosis, the anatomic extent and severity of bronchiectasis. 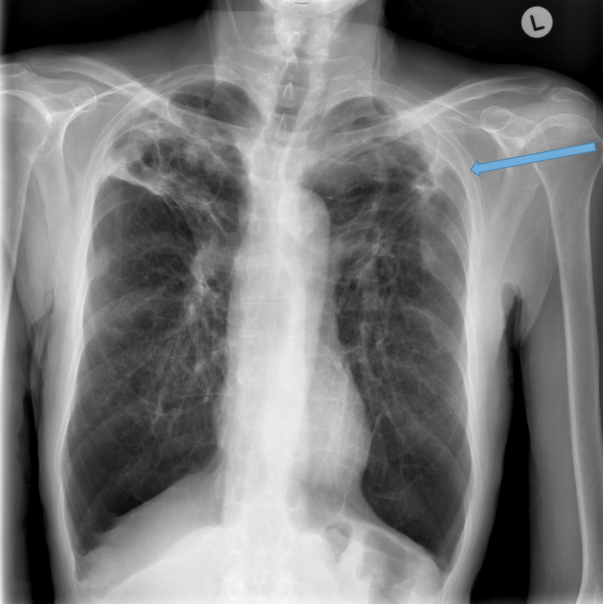 CXR is utilised in the follow up of these patients once a diagnosis has been established, particularly when they present acutely with an exacerbation. As bronchiectasis is a chronic illness often requiring multiple hospital admissions throughout life for acute exacerbations, we must remain cognisant of the cumulative radiation dose to each patient. 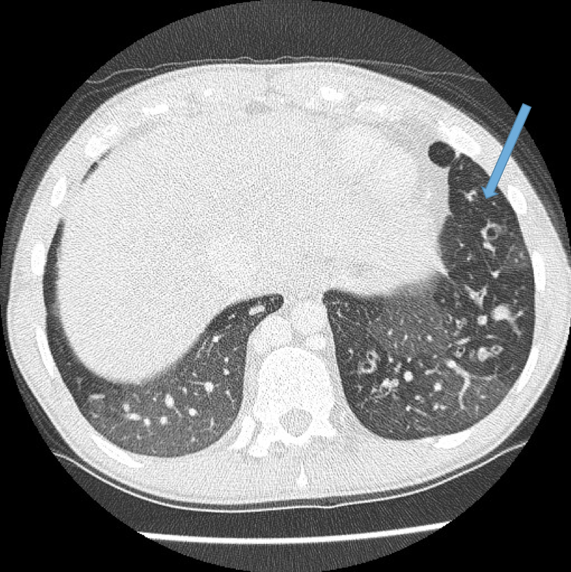 In difficult to interpret CXR’s or patients who fail to improve post conventional antibiotics, HRCT can be utilised to assist in ongoing management by ruling out unusual infections such as mycetoma, demonstrate new or progressive lobar collapse or to guide bronchoscopy.